Enabling Trilogy to deliver products and services, in an efficient and effective manner, that result in a consistently high level of customer satisfaction. 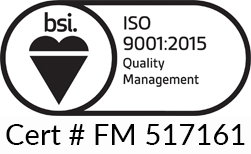 The management and employees are fully committed to complying with the requirements of international standard ISO 9001:2008 and the Quality Management System (QMS). We will ensure that the effectiveness of the QMS is continually improved, constantly raising standards. Senior management within Trilogy has developed a framework to identify and establish the organisation’s quality objectives and to facilitate their periodic review to ensure continual improvement. Ensuring all our staff understand the Quality Management System established at Trilogy, and that it is routinely monitored by each of our department managers. We also regularly review this quality standard to ensure it continues to meet our customers’ needs.